Welcome to my new personal website – charting the progress of my Atlantic expedition. Rowing across the Atlantic has been a dream of mine for several years now and I can’t wait to get out there – or rather I can’t wait to get to the other side. Three weeks ago I went down to Christchurch in Dorset to take part in a sea trial for a 6 man crew aboard Sara G which will be attempting to break the World Record for rowing across the Atlantic – currently a speedy 32 days. I was offered a berth in the team straight after the trial and now its full throttle with my expedition preparations. For those of you that were following my previous expedition plan – Atlantic2brave – my rowing partner George unfortunately suffered a serious injury to his leg for which he has been receiving surgery – he had to withdraw from the event due to medical advice. George is still hoping to put together an expedition in a few years time and I wish him all the best. 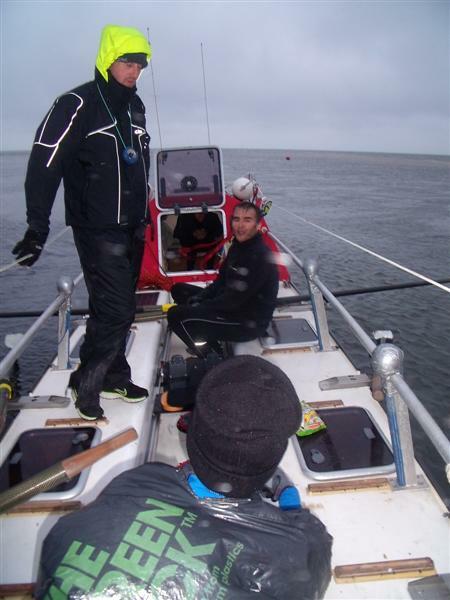 With my plans scuppered I thought my Atlantic hopes for 2012 were lost – until I discovered that World Ocean Rowing, skippered by dual world record holder Matt Craughwell, were putting together an expedition team for January 2012. The possibility of being involved in a world record attempt was something I just couldn’t resist. I quickly got in touch with Matt and signed up for the sea trials in July. The sea trials for this unique team have been highly subscribed and people have been flying in from as far away asAustraliaand theUSto take part – so I knew it was going to be tough competition even if I only had a 2 hour drive to get there from where I work in Marlborough. To say I got a ‘Baptism of Fire’ into the world of ocean rowing would be a slight understatement. I have 16 years of rowing experience and have raced in coastal rowing before too but I have never had to deal with conditions like we had on the English Channel that night. Our trial was brought forward from Saturday morning to Friday night because of some approaching weather. So at 9pm on Friday night we pushed off from the marina and rowed out to sea with rain pouring and the last dregs of daylight fading away. Sitting aboard ‘Sara G’ for the first time with 5 people I had just met 2 hours earlier was a fascinating experience – just to imagine what it would be like to spend every waking and sleeping minute in this small space with these 5 people for over a month. We began directly practicing the shift pattern used for crossing the ocean – 2 hours rowing and 2 hours of rest, continuously. We got out to sea pretty quickly without any hitches and headed westward along to coast towardsDevonbut soon the wind began to really pick up and we realized we were going to be in for a hell of a night. The wind and waves were so relentless that navigation of the coastline became pretty tricky – so as a result our experienced skipper needed to stay on the rudder all night to keep us out of trouble. With one less person available to row this meant our shift pattern changed from 2 hours rest to just 1hr40mins on each changeover making it even tougher. I really enjoyed being on the oars battling the elements – but I was not so immediately keen on the rest period in our enclosed cabin in the stern in what felt more like a washing machine. But I was pleasantly surprised how quickly my body adjusted to the strange pattern when by its normal routine I should have been tucked up in bed. Most of us had some sea sickness problems because of the short intervals between pretty big waves – especially when returning to the small cabin after shifts. I had one moment where the nausea got the better of me and I needed to pop my head out of the cabin – but the gold medal for sea sickness by a nautical mile went to a fellow young triallist from Seattle who spent most of the trip with his head hanging over the side of the boat. That was an awful long way to travel just to make himself ill.
We decided that we would aim for the next low tide to take our boat back to the marina and made our way there after 12 hours in a rough sea. We had to battle against some strong tides and deal with a beaching or two while making our way back up the estuary but we made it safe and sound. Oh how I slept like a baby the next day!! Having started out not knowing for sure if I would enjoy the experience I was delighted to discover that I loved it – even the tough parts. Our skipper, Matt, said it was the most difficult sea trial he had been involved in over the years. Rising to meet the challenge was great but I know the Atlantic is going to be another experience altogether. I’m really looking forward to getting back out in Sara G later this month but hopefully in more tranquil conditions.